The Website www.danube-places.eu introduces 80 towns in four different countries the development of which was influenced by German settlers. In some villages the German settlers shape the cultural and economic life until today. In others last traces can only be found in the local architecture or is reflected on cemeteries, since many inhabitants had to flee or were displaced after World War II. Migration of Germans to Hungary in the south-eastern part of Habsburg began more than 300 years ago. More than 400.000 people came to the former Kingdom of Hungary in the 18th century. Although they were all of different origin they used to be called Swabians. Only in the 20th century the term Danube Swabian became widely used for this German minority in Hungary, Romania, Serbia and Croatia. The website www.danube-places.eu traces these historical relations. On a virtual journey, the viewer is taken from the places of origin in the south-west of Germany on the Danube to the settlement areas like Budapest, Satu Mare, Pécs, Timișoara or Novi Sad. The website gives information on important buildings and monuments, explains historical developments and shows touristic destinations of the towns with German heritage. 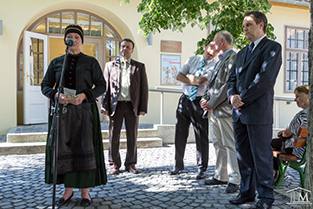 In 2012 and 2013 seven Museums from Germany, Hungary, Romania and Serbia have been cooperating on this project about the history of Germans in the settlement areas of Danube Swabians. 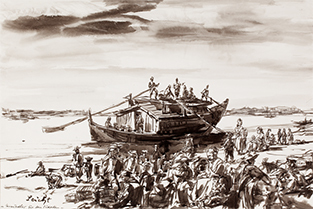 The project “Migration in the Danube Region” aimed at mediating new scientific findings about the settlement of Germans and information on their societal contributions to a broader European audience. The project was included in the Cultural Programm of the European Union’s Education, Audiovisual and Cultural Executive Agency. The Project is divided into two parts: a travelling exhibition which was shown in seven cities in Germany and south-eastern Europe between May 2012 and October 2013: Ulm (DE), Satu Mare (RO), Timișoara (RO), Reșiţa (RO), Pécs (HU), Novi Sad (RS). The exhibition catalogue (view pdf) is available in the languages of all participating countries. The exhibition shows objects from all partner museums, among them documents, images and artefacts like a child’s coffin from the time of migration. The second part of the project is the development of the website www.danube-places.eu. The exhibition's vernissage in Pécs in June 2013. The settlers came via the Danube on ships called Ulmer Schachteln (literally: "Ulm's boxes"). 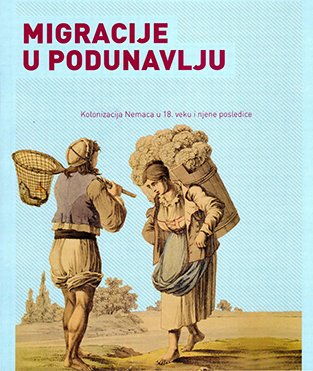 Cover of the catalogue in Serbian.